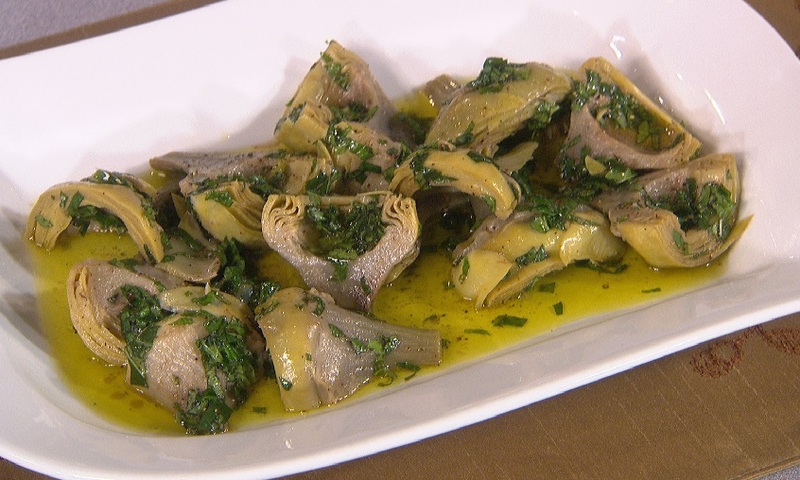 Carciofi alla Romana: Carciofi alla romana, literally “roman-style artichokes”, is a typical dish of Roman cuisine. In Rome, it is prepared in each household and served in all restaurants in spring-time. Together with the Carciofi alla giudia, it represents one of the most famous artichoke dishes of the roman cuisine. Take an artichoke and peel off the outer leaves until you reach the paler inner leaves. Trim the stem and slice off the top of the artichoke so the heart is visible. Scoop out the hairy choke. Put the trimmed artichoke into the bowl of lemon water to prevent discolorationdue to oxidation. Continue preparing the remaining artichokes. Combine the lemon zest, herbs (flat-leaf parsley, sage and mint), garlic, chilli, parmigiano reggiano, breadcrumbs and oil in a bowl. Drain the artichokes from lemon water. Stuff each artichoke generously with the breadcrumb mixture by gently separating each leaf and pushing the stuffing into the gaps. Tightly pack the artichokes into a baking dish. Add enough water to just cover the base of the dish by a couple of centimeters. Bake the artichokes in the oven for about 20 minutes, or until the artichokes are tender when pierced with a skewer. Carciofi alla Romana is ready to be served.